What I ended up with was quite different from what I had in Portugal, but it was still quite tasty. It was the result of combining together several recipes that I found online, and simplifying them a bit. 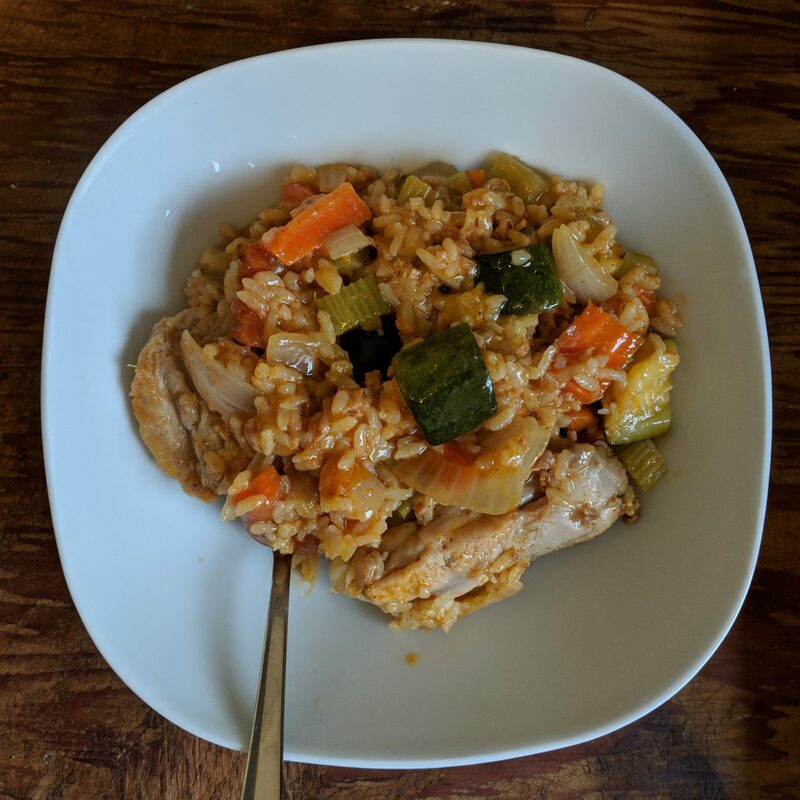 I already had rice, onions, carrots, celery, and zucchini, so I just needed chicken and chouriço (chorizo in Spanish). I walked down to the local grocery store and they had Mexican-style chorizo which is uncooked pork and other sausage ingredients loose in a bag, but not the smoked chouriço that they eat in Portugal, which is a smoked firm sausage in a pork casing, sort of like a salami. But I rolled with it, and I picked up some paprika as well for the recipe. 4 Chicken thighs (skin-on, bone-in). I had large ones, so I chopped each one into a few pieces, each about 2″ by 2″. 1 9oz raw Mexican style chorizo, chopped or torn into chunks. You can substitute kielbasa or other kinds of chorizo/chouriço if desired. If you don’t eat pork, use a substitute sausage with similar seasonings. Here are the steps to prepare it. Chop (if needed) and season chicken with salt, pepper, and paprika to taste. Heat a dutch oven or shallow stock pot on the stove over medium high heat and add about 1 tbsp olive oil. When pot is hot add chicken and sear one side for 3-4 minutes. Turn over chicken pieces and do the other side for another 3-4 minutes. Note that chicken will not be fully cooked yet! 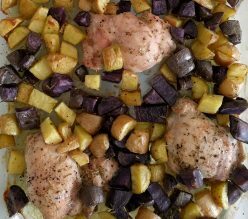 Put the chicken aside and drain the juices from the pot into a small dish (we’ll add it back later). Don’t clean the pot – It’s OK to leave small bits of chicken skin/meat stuck to the bottom of the pot for now. Add remaining olive oil to pot and heat over medium heat, and add vegetables (including onion and garlic). Stir-fry them for about 4-5 minutes. 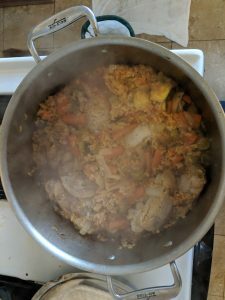 Add rice, chorizo, and chicken stock, and turn heat up to medium-high. When liquid is simmering reduce back down to medium. Cover and let it cook for about 10-12 minutes, stirring occasionally. If it starts to smoke, add some water (preheated water from a kettle if you have it is best, so it doesn’t cool down too much). Add chicken and the set-aside juices from before, and stir to mix things well. Cover and let cook for about 15 minutes (watch for smoke, and add water if needed as before). This will keep you fed for a while! After eating one serving, I had enough to completely fill a 10″ by 10″ Corningware dish. I’d say there are probably 6-10 servings depending on how hungry you are. 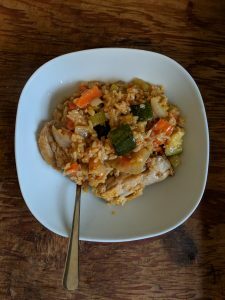 It makes great leftovers that microwave up nicely, or you can freeze portions for a later day if you think you’ll get tired of it. Warning: As always when eating chicken or pork, make sure that the meat has been fully cooked before eating. Internal temperature should be at least 165° F (74° C) but this should not be a problem as long as the pieces are not too big, since it’s been in boiling liquid. Measure internal temperature before eating just to be sure with a meat thermometer.